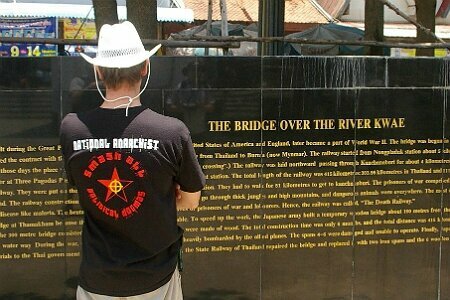 Finally, here is a report about the National Anarchist Asia Tour 2008. The report was written by one of the participants, and it is purposely written as an eye witness account, without too many political statements. The aim of the report is to give a personal account of the trip. One of the aims that we tried to achieve with this tour was to show the participants how the native people live. Two of the guys who came with us had never been in Asia and one can say that it was a real eye opener for them. Not only did we see the most amazing cultural sights and landscapes, but we mixed with the people as much as we could: we ate their local food, travelled in their buses and experienced the life they lead. And by the end of the trip it was very clear to us that the people in Laos, Vietnam, Thailand and Cambodia have the same needs and wants as we have here in Australia, namely the need for financial security, preservation of their culture against the never-ending tsunami of American influence and the preservation of their community’s identity and survival.